The regiment with the largest number of soldiers from Rutland was, not suprisingly, the Leicestershire Regiment. On this website we have the stories of 156 men who died. 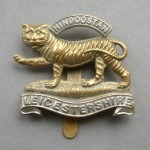 The Leicestershires were represented in many of the main theatres of the war – the Western Front, Mesopotamia (now Iraq) and Palestine. Their cap badge of a tiger gave name to the shouts of encouragement in battle as it does on the rugby field today. In 1908 when the Territorial Force was set up, the 5th Battalion consisted entirely of volunteers, with the Oakham Company as one of its component units. These were the men who set off for annual camp at Bridlington just before war was declared and came hurrying home at the outbreak of hostilities. 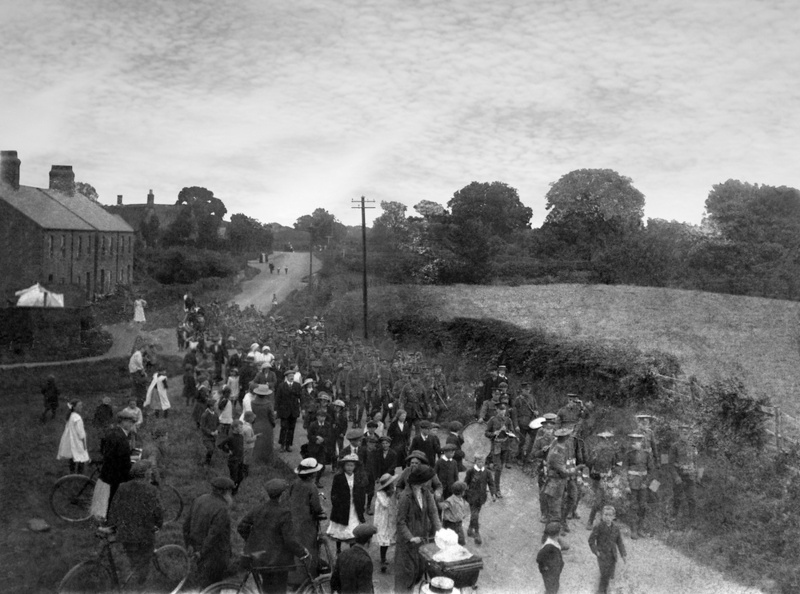 And these were the men pictured leaving Oakham and marching through Langham (photo courtesy the Nourish family archive) on 6 August 1914 on their way to war accompanied by a bugle band and cheering onlookers. Around a hundred left that day, 19 were later killed. The 1st and 2nd Battalions were regular units. The 1st Battalion was in Ireland at the start of the war before being sent to France and taking part in the so-called “Race to the Sea,” the Battle of Armentieres and First Battle of Ypres as part of 6 Division. The 2nd Battalion was swiftly recalled from India. It arrived in France on 12 October 1914 and suffered severely the following Spring in the Battle of Neuve Chapelle in March 1915. The 4th and 5th Territorial Battalions first saw action in 1915 at Hooge, outside Ypres and in the Battle of Loos. There is many a reference on this site to the Hohenzollern Redoubt, a vast German strongpoint, and the desperate – and ultimately fruitless – attacks made against it by these citizen soldiers. They formed part of 138 (Lincoln and Leicester) Brigade, 46th (North Midland) Division. The following year the Battle of the Somme involved the newly-formed 6th, 7th, 8th and 9th Battalions, men who were part of the New Armies raised by the secretary of state for war, Lord Kitchener. They fought as the 110th Infantry Brigade, part of 37 Division. While the 2nd Battalion transferred to the Middle East, the attritional fighting continued along the Western Front. In 1917, Third Ypres was underway and the following year the great German spring offensive swept all before it until the British turned the tide and the Advance to Victory began. The Leicestershires suffered grievously in these final battles – indeed the highest number of Rutland deaths on a single day was during the Second Battle of the Somme. Click here for a brief account of the role each Battalion played in the First World War.